Limes provide many health benefits, some well known and others that are not as obvious. Originally grown in India, they are cousin to the lemon and became popular in Europe, moving to the United States as the population grew. They are grown in Florida, California and the Southwest regions of the United States. Because of their health benefits, limes were a required fruit on British naval vessels during the 1800s. Limes pack a powerful amount of vitamin C in a small package. 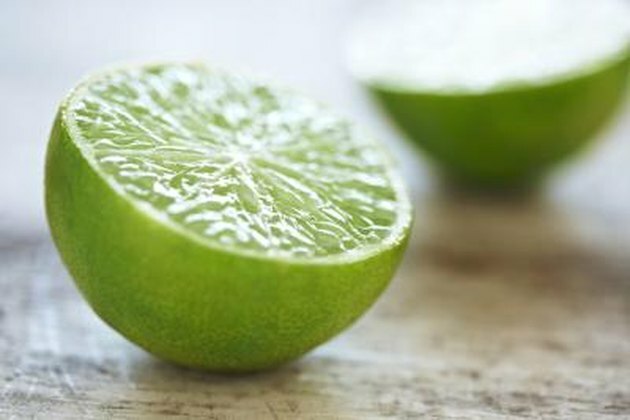 One whole lime, typically about 67 grams, contains 35 percent of your daily vitamin C requirements. Vitamin C may help prevent colds from developing and may minimize cold symptoms. Though no studies define vitamin C as a cold cure, athletes and those in isolated conditions have reported a 50 percent decrease in getting colds by supplementing with vitamin C.
Flavonoids in limes appear to help prevent cancer. Limes include a flavonoid, flavonol glycosides, that appears to stop cell division in many types of cancer. A 2010 article published in the "Journal of Pharmacy and Pharmacology" studied how oral cancers responded to the introduction of the flavonoid. The author's findings state that flavonol glycosides, when mixed with saliva, inhibit the growth of oral cancer cells. The flavonoid in limes appears to also stem the growth of bacteria. Tribes that include lime juice in their daily diet appear to have diminished outbreaks of cholera. Cholera is the result of the bacteria Vibrio cholera. By adding lime juice to sauces eaten with rice, researchers have been able to protect against outbreaks of cholera epidemics, as noted in an article in the November 1997 issue of "Journal of Food Protection." While is isn't clear why limes have this protective effect, one theory suggests that the acidic properties of the juice inhibit bacterial growth. One raw lime provides about 7 percent of daily fiber needs. Fiber is critical to maintaining digestive health. This helps improve nutrient absorption and bowel movements. Limes provide a strong flavor that can enhance your cooking. Each part of the lime can be used. You can use the peel as a zest by gently grating the outer peel after washing the lime thoroughly. You can add the juice to water for flavor or add it to recipes to enhance the spices. Add the flesh to fruit salads, on kebabs for a bright flavor or cook directly for an intense taste.